The Chinese National who threw a "taho" at a PNP member at the mrt-boni station, was finally charged with the criminal complaint of unjust vexation, disobedience to an agent of person in authority and direct assault. 1. Unjust Vexation is an offense punishable by the Revised Penal Code which carries an imprisonment of arresto menor or a fine ranging from 5 pesos to 200 pesos, or both. Arresto Menor is imprisonment of 1 day to 30 days. 2. It is a light offense which prescribe in 2 months. 3. Unjust Vexation is distinguished from grave coercion by the absence of violence. 4. Any act committed without violence, but which unjustifiably annoys or vexes an innocent person amounts to light coercion. Conquer Review Center "Conquer the world, Conquer the board, Together we conquer". 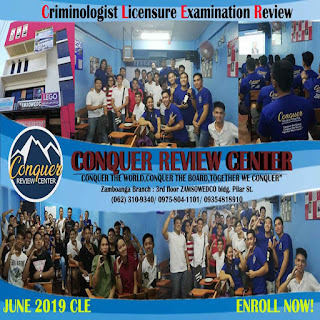 Conquer Review Center Zamboanga branch is still accepting enrollees for the June 2019 Criminologist Licensure Examination. Visit their office at the 3rd floor of Zamsowedco building located at Pilar street, Zamboanga City, fronting Southern City Colleges. Justifying circumstance affects the act, not the actor; while exempting circumstance affects the actor, not the act. In justifying circumstance, no criminal and, generally no civil liability incurred; while in exempting circumstance, civil liability is generally incurred although there is no criminal liability. Distinguish between justifying and exempting circumstance. Complex Crime of Multiple Murder with Multiple Frustrated Murder Filed against the Jolo Cathedral Bombers. For purposes of the criminology licensure examination, bear in mind that there is no provision in the Revised Penal Code which defines Damage to Property and penalizes it as a felony. Malicious Mischief, punishable under Art.237 of the Revised Penal Code, is the nearest felony which a complainant may utilize for the purpose of filing a complaint involving an intentional destruction of property. 1. Distinguish intent from motive in Criminal Law. 2. May crimes be committed without criminal intent? 1. Motive is the moving power which impels one to action for a definite result; whereas intent is the purpose to use a particular means to effect such results. Motive is not an essential element of a felony and need not be proved for purpose of conviction, while intent is an essential element of felonies by dolo. 2. Yes, a crime may be committed without criminal intent is such is a culpable felony, wherein intent is substituted by negligence or imprudence, and also in a malum prohibitum or if an act is punishable by special law. 1. Distinguish "motive" from "intent". 2. When is motive relevant to prove a case? When is it not necessary to be established? Explain.